© 2007-2019 The Spitfire Society and respective copyright holders. To the Eastern Wing of The Spitfire Society. You can find out who we are & what we do by following the links on the left. 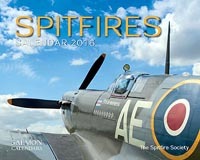 Spitfire Society Calendars 2019 - we are not producing a calendar for 2019 as our current manufacturer is no longer trading. Calendars will be back in 2020. Form 700 is our newsletter - the expanded online version of No.60 is now available. Our current 'Spitfire Society Interview' is with Ken Coop as he remembers flying the Mk XXIV. Membership - looking for gift ideas? How about Spitfire Society membership? See 'How To Join' for further info. Merchandise available through Spitfire Enterprises Ltd. Please see the 'Merchandise' page for more details.